I had 4 blocks left over from making the Metro Hoops Quilt and decided to make a pillow. I quilted the center with feathers. Then just SID around the hoop and the echoed just once to emphasize the hoop/circle. For the outer area of the hoop, I was inspired by Jenny@SewKindOfWonderful. I haven't done much of straight line quilting. But like Leah Day says I find it faster to free motion quilt the straight line over using walkfoot/regular foot. Its so much faster and no hassle with pivoting. But I did roughly mark my lines using a disappearing ink pen. And the quilting really go by fast. You're going to see more of straight line quilting in the future :-). My daughter already claimed this to be hers and wanted it to hang in her room. So, this is going to a wall hanging rather than pillow. For the corner squares I used Angela Walter's design which you see in so many of her quilts. I'm not yet comfortable with quilting varying widths of figure 8s. Metro Hoops Pillow - with extra block I still haven't gotten bored with quilting feathers. For the outer ring/hoop I might just Quilt-in-the-ditch and then echo it once. The outer most negative space I'm thinking of some straight line quilting. I made this quilt for my 4year old nephew who loves Lightning McQueen. The center of the quilt is a printed panel and I added couple of borders to it. I really enjoyed free motion quilting on my domes sewing machine - Singer Stylist 9960. 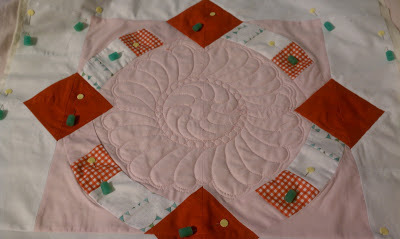 The "Rolling Tires" FMQ on the red border and flames quilting on the outer most border. I just highlighted the center panel by quilting around the motif/car. Now entering this quilt in the Home Machine Quilted category in the Blogger's Quilt Festival. Checkout the other awesome quilts in the Favorite Home Machine Quilted category. I had the wonderful opportunity to test a pattern for Jenny@ Sew Kind Of Wonderful. She & Helen invented the Quick Curve Ruler(QCR) and they have many amazing modern patterns using the QCR. Here is my Metro Hoops quilt. It was really fun to make. In the last year or so I have used few patterns but I had to always make them simplified for piecing. But with Jenny & Helen's Metro hoops pattern I didn't have to modify a single thing. Everything was so well thought out and piecing was so much more fun. Also there were few squares up to allow room for errors. So, this works for any one from beginner to advanced quilter. Here are couple of pictures of the Quilt top. Saturday after my daughter's piano recital I quickly went out to get few pictures of the quilt top. I know I have been blogging a lot lately but have been sewing a lot between Metro Hoops Quilt and "Quilts for Boston". I took some 20 blocks to make this quilt top. It was amazing to see how blocks made by different people all around the world came together so well. I will be also quilting this quilt completely including binding. I just can't wait. I always have hard time making a quilt label. I feel it should look professional and good especially if you're gifting to a non-quilter friend/family. Not sure, if they really appreaciate all the work that goes into it. I always keep my fingers crossed to see if they really like the gift or not. Recently I finished two toddler quilts for my nephew (4yrs) and niece(2yrs) and wanted a quilt label more personal and as adorable as they are. I thought the quilt labels were cute, even though not perfect. 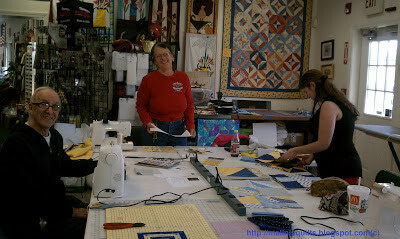 I had a really fun afternoon @Bits N Pieces Quilt Shop in Pelham, NH today. They generously donated all the fabrics for the blocks and had accumulated a lot of blocks by end of the day. I wish I had stayed back to count the blocks. Lets first meet the team who were making blocks while I was there. Alyssa, Alicia and the gentleman in the picture were making blocks after blocks as a team. Here are the blocks which I made during the sew-in. First one was kind of planned. The other 2 were improv piecing to use up the scraps I created making the block1. This was a fun afternoon well spent.